Cape Town - South Africa took a giant step towards being named hosts of the 2023 Rugby World Cup on Tuesday when World Rugby, after conducting and independent analysis of all three bids, recommended them as favourites to host the tournament. The sport's international governing body had hired independent auditors to examine bids from South Africa, Ireland and France and then provide feedback. After that process, South Africa emerged as the 'winners' with France second and Ireland third. South Africa scored highest in two of the latter three criteria which combined to make up 85% of the total weighting. 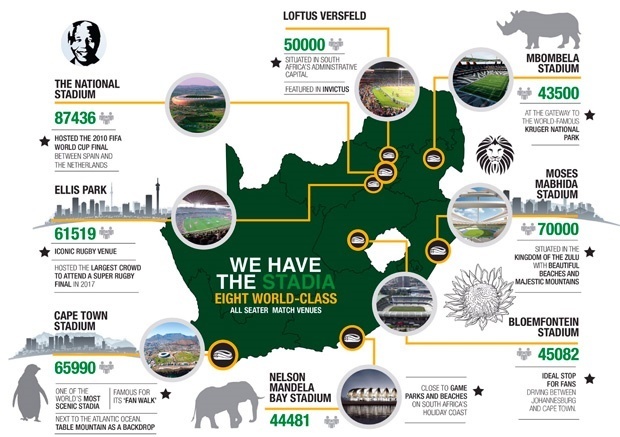 South Africa's stadiums and infrastructure - a number of which were constructed for the 2010 Soccer World Cup - gave the 1995 Rugby World Cup hosts the edge. However, Tuesday's nod is still not official confirmation that South Africa will host the tournament as the World Rugby Council must still vote where the spectacle will be staged. Interestingly, Ireland were the bookmakers' favourites to host the tournament before Tuesday's announcement, but eventually scored the lowest percentage overall at 72.25%. France scored 75.88%, while South Africa managed 78.97%. The host nation will be officially confirmed on Wednesday, November 15 from 15:00 SA time onwards.